WITH all the rumours that our government is running out of money, the state of Mzansi’s public clinics and hospitals is so dire that we can only believe these rumours. In the news there are stories of hospitals without enough beds or of medical interns who are told they will not be paid for their work. But amid the horror, there are also stories that shine through the dark. Janet Manaswe knows all about the terrible conditions at state hospitals. “I have high blood pressure which affects my sight. It’s a serious problem, and I often had to wait at the hospital for a long time for my medication. “It was a burden and a struggle going to the hospital. It took so long, and sometimes I would not get the medicine which forced me to return again. 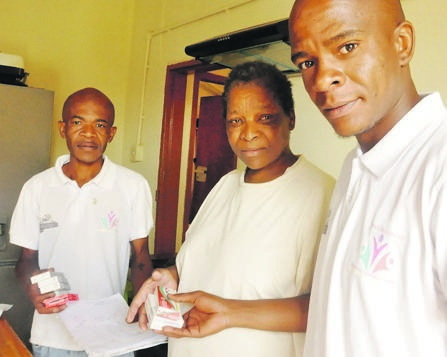 The solution comes from the three members of the Matlhogonolo Community Outreach Centre. They heard of the trouble people in collecting their medication, which included pensioners and the realy sick. Prince Phetoe, founder and chairman of the outreach organisation said: “I started this organisation to empower pupils by making sure they got all they needed, like stationery and uniforms. Matlhogonolo Community Outreach Centre is based in Diepkloof. It had seven members in 2017 but the number has dropped. They are finding it hard to replace the lost volunteers with new ones.